Handmade by women in Guatemala, each bohemian-inspired bracelet offers a subtle nod to our planets. 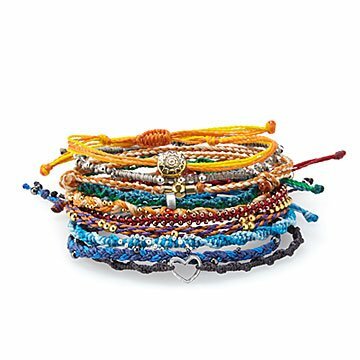 Whether you're a free spirit or just enjoy a touch of bohemian style, this set of 10 bracelets gives any outfit universal appeal. Each adjustable piece offers a subtle nod to our planets using distinct colors, beads, and charms. Sun, for example, features a delicate gold-hued sunburst charm, while over on Earth, a silver "moon" moves on a braid of lush green. Stack the complete set for a stand-out look, mix and match, or wear them individually for just a hint of celestial sparkle. The set arrives on a card that highlights the details and meaning of each bracelet. Handmade by women artisans in Guatemala. Go behind the scenes of these otherworldly bracelets (get it?) on our blog. This is my second buy! Already said above. Terrific catalogue, wonderful,creative gifts. I bought 2 of these bracelet sets - One for each of my younger daughters. They absolutely LOVED them. The colors are beautiful and there are so many bracelets that they split them up and alternated them on different days or occasions. I think these were a little over priced. I split the bracelets up to give 3 to my daughter-in-law, 3 to a friend and 3 for me. Not sure what to do with the last one. While I love the look, putting the bracelets on is difficult and time consuming. Had to resort to using my teeth! I bought this for my daughter for Christmas. She loved it! Split up bracelets between both daughters n they put them on right away n loved them. I bought this for my daughters to split. I was worried that it would not look as nice as in the picture but it did! Really cute, and there were enough for them to share it and still have a cute bunch of bracelets!